2 Bedroom condo in Panama City Beach - Book Your Beach Vaca! Best Reviews PCB! Beachfront HUGE Balcony! Free Beach Svc. Book Your Beach Vaca! Best Reviews PCB! Beachfront HUGE Balcony! Free Beach Svc. 1 / 46 Enjoy the largest balcony in Panama City Beach.....10' wide x 28' Long!! SIMPLIFY YOUR VACATION!! Ocean Reef on the Quiet West end of PCB. Pack your swim suit and flip flops, we have covered the rest of your vacation needs! Our spacious, brand new beachfront condo comes fully stocked with everything your family needs for a fabulous vacation. Free Beach Service (just give the attendant the unit number and they'll set up your umbrella and heavy duty lounger chair with cushions), Karaoke, Board Games, Water Toys, Football, Beach Cooler & Movies are just a few of the extras you will find at our vacation home. GREAT LOCATION!! We are on the quiet west end and close to all you could ever desire: Fabulous Entertainment, Great Restaurants, Shopping, Putt-Putt, Go-Carts, Exciting Water Excursions & Activities, just to name a few. Minutes from great Golf Courses, Grocery Stores, Wal-Mart, Gulf World Marine Park and the Frank Brown Sports Complex! The new Bay County International Airport is nearby and we are walking distance (1 mile) from the very popular Pier Park. PIER PARK: The 900,000 square foot mega family entertainment complex is the largest venue of its kind in Northwest Florida. Pier Park is a beautifully landscaped complex with festive, colorful Caribbean architecture. From the many favorite restaurants and national chain stores, Pier Park also boasts beautiful walking paths, a park for summer concerts and festivals, a 16 screen movie theater and much more. Pier park is the perfect destination for families, couples, kidseveryone! And don't forget to check out the City Pier right across the street, they offer very economical fishing packages! CONVENIENT PARKING!! Reserved parking is located directly beneath the Ocean Reef, so you will not need to cross the street for parking, as is the case with most condos in Panama City Beach (PCB). Simply park and walk a few spaces to one of the high speed elevators. If you have multiple vehicles, there are available unassigned spaces on many levels of the parking garage, and overflow parking across the street. AVOID THE TRAFFIC!! Use Nautilus St., directly in front of Ocean Reef, to easily get to Back Beach Rd. (aka Hwy. 98), so you can avoid the busier traffic on Front Beach Rd. If you want to check out the East end of PCB, you can easily get onto Middle Beach/Hutchison Blvd. from the condo, and again, save some time. GREAT LOCATION! AMAZINGLY HUGE BALCONY!! 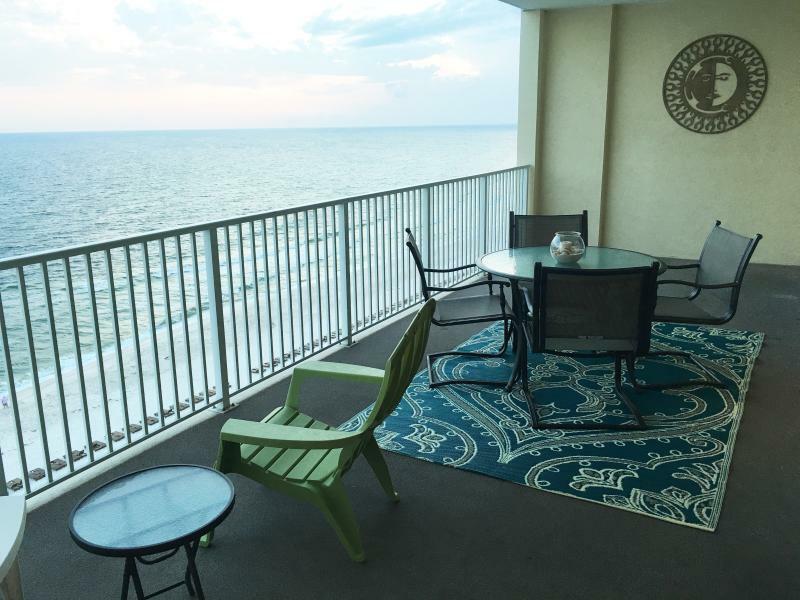 You will be mesmerized by the view from one of the largest balconies in PCB! Enjoy the 10' Wide x 28' Long balcony located on the very desirable 11th floor. You can easily see marine life such as DOLPHINS, STINGRAYS, LARGE FISH and even SEA TURTLES as they swim and play before you. PELICANS and SEA GULLS will glide on by as you relax outdoors sipping your morning coffee or your afternoon refreshment. TREAT YOURSELF TO A FANTASTIC VACATION!! Surround yourself with emerald green and sapphire blue waters. Relax and unwind as your toes sink into sand as soft and white as powdered sugar. The perfect beach vacation awaits you here at The Ocean Reef, one of the newest Gulf Front condo developments with over 320 feet of uncrowded beachfront. SEE YOU SOON!! If you are looking for a Stress-Free, No-Hassle, Rejuvenating Vacation with all the Comforts from Home at a Great Value, then LOOK NO FURTHER. #1104 at Ocean Reef is all this and so much more!! We really enjoyed staying in Milly's condo on the beach! It is very centrally located with Pier Park just a short distance West, Go Carts and Golf behind, an Ocean Front view, and so many other attractions and the State Park just down the beach to the East. The pictures are accurate, but the roar of the ocean and 11th floor views can't be adequately replicated. The sunsets, they are amazing! Enjoy. We sure did. Daily, reserved beach chair service was an unexpected plus. It's now on our "highly recommended" list. Thanks again, Milly! I have been going to Panama City Beach since the 80's and this was one of the nicest and roomiest places I have stayed for the money. The bedrooms and bathrooms are larger than you would expect. Will probably stay again. All the other guests in the building were so nice and friendly and so were the maintenance guys who were always on the go keeping things nice. I have been going to Panama City since 2009. We have stayed at this condo the last 3 years. I will never stay anywhere else. You get so much for your money. It is very spacious, beautifully taken care of, clean, homey and has everything you could possibily want for a vacation. The beach services are the added bonus. The balcony is large and you get lost looking at the ocean. We always want to stay longer. 1104 is just perfect. Wonderful location, condo is beautiful, balcony is fantastic and provides an amazing view day and night. Corey and Milly have everything possible to make their condo and your stay the best ever. From the beach chair service to the games, movies, beach toys and the wonderful decor of the condo, you won't find a better place to stay. Will definitely be back. Thank you for sharing your condo! Had a wonderful stay in 1104 with our daughter and son in law. They made use of the free chair rental every sunny day, and we enjoyed the view from our spacious balcony. Beautiful condo and view. Spacious and close to everything. Would definitely revisit. Our family absolutely loved this condo! The views were amazing and the balcony was outstanding. We loved eating breakfast and drinking our coffee while just looking at the ocean. Milly and Corey was wonderful in answering our emails and questions before booking.The parking garage was a plus and loved having an assigned parking spot. The decor in the condo was beautiful and had so many extras. We used the lounge chairs that were included on the beach. The location was excellent and wasnt the beach area wasnt crowed like some of the condos around. Will be staying again! My family was there the last week of June, and it was our first time staying at Ocean Reef in Milly's condo. It was exceptional! We had everything we needed, and the condo was the best we have stayed in since we started going to PCB almost 20 years ago. We will definitely be back! Absolutely loved this condo! The views are amazing! Milly was wonderful in answering our emails about our stay and questions. The parking garage was a plus never having to fight for a spot was awesome! The condo was decorated very cute and very clean. They had it stocked with everything for the beach which was a huge plus. Also having the lounge chairs on the beach was wonderful they really did think of everything! Family friendly atmosphere. Will be staying again!